Knitting :: A pair of plain striped socks using Knit Picks Essentials, purchased from a local Raveler during a destash last year. No pattern, just top down with a heel flap, 72 stitches around on US 0 needles. These are my first socks on 0s, as per Nika‘s suggestion, and I really like how the fabric is turning out – it’s not too stiff, but I think the density will add some durability. Reading :: I finished all of A Hundred Summers by Beatriz Williams, which I really enjoyed. It was a perfect beach and camping read, very summery, but it actually had content and a pretty engaging plot, which I sometimes find “beach reads” are lacking. I loved the historical setting as well, and the seaside sounded just dreamy. 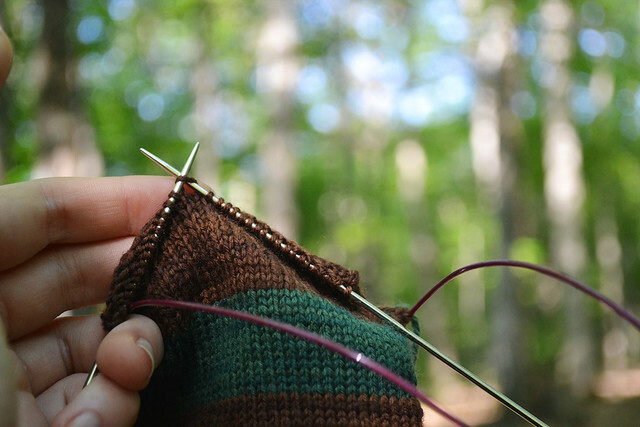 What have you all been knitting and reading this week? 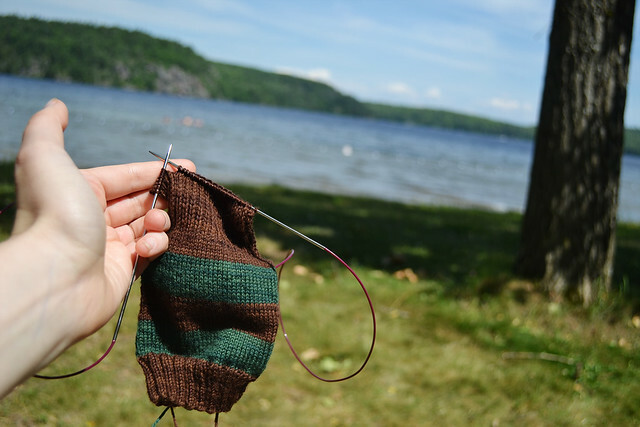 Linking up with KCCO and Yarn Along (congrats, Ginny, on your baby girl – she’s beautiful!). Beautiful knitting! 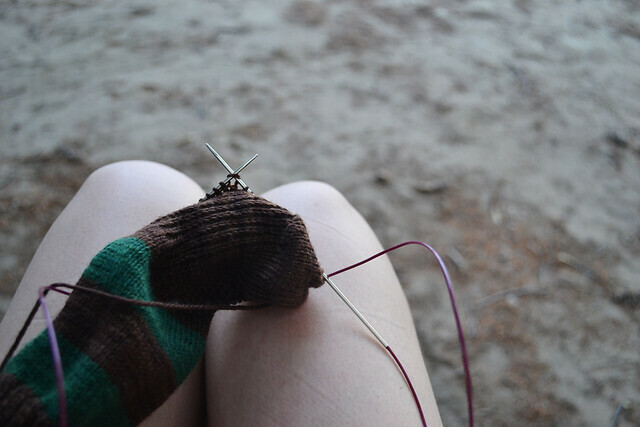 Socks are the perfect portable summer knit. I have tried socks on zeros and I am not a fan of the teeny, tiny stitches. I think that has more to do with the age of my eyes and less the fabric which I obtain. I have better luck with more tightly twisted sock yarns – and even better luck with my own handspun sock yarn – I have 2 pairs of socks knit from BFL that I made over 5 years ago – not a single area of wear and I use them the most frequently of all my socks! As for reading – I am listening to Dead Water by Ann Cleeves and really enjoying it! Beautiful socks. They are perfect for camping! I love your beach pictures. I miss living on salt water. Those socks are great! I wouldn’t have chosen those colors, but they are lovely together. Portable projects are the best for summer. How lovely to have such a view while getting in some knitting.